Just about everyone who uses the internet with any regularity is familiar with those ubiquitous search ads. But did you know Google, Bing and Yahoo search engines offer a separate, more visual search-based ad tool that offers a number of distinct advantages for certain brands? You didn’t? Well, it’s your lucky day – our digital media team just so happened to put together a handy rundown of this tool – and how it may be able to impact your digital marketing plan. 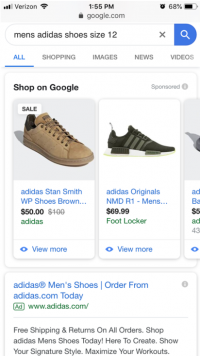 Many business owners are familiar with these search ads (text results signified by the “AD” badge), yet many are unfamiliar with shopping ads. Shopping ads are specialized ads for retailers who would like to promote their online and local inventory on Google, Bing and Yahoo – as well as their partner sites like YouTube, Maps or the image search tab. Shopping Ads offer some unique advantage over text ads. The biggest? Web users get to see how the product looks. It is important to showcase what makes your products better and different than your competitors – and Shopping Ads do just that, allowing you to promote your products with detailed photos, pricing and your store name (as well as additional information). Giving customers this valuable information means that they are well informed before they click the ad. Well-informed customers are significantly further along in the purchase funnel – and ultimately more valuable than your average web user. Shopping Ads appear at the top of the search results page and take up a large portion of the space, especially on mobile devices. Mobile shopping continues to rise year-over-year – making it more important to be in front of your customers on the right device with the right offer. According to Google, shopping ads have, in some cases, earned advertisers up to two or three times higher click-through rates in comparison to text ads. Similar to Search Ads, Shopping Ads are only triggered when a web user searches for your product or a similar product. More than one of your products may appear in the Shopping Ad results and, if relevant, your Shopping Ad may appear next to a text ad at the same time. This is an excellent opportunity to increase your brand’s awareness on Google’s most valuable real estate. Increase product awareness – Show more than one product alongside text ads. Drive qualified traffic – Provide customers with valuable information before they click to your site. Reach more shoppers – Show up in searches for your product and relevant products. Standout – Detailed images, pricing and store name, give you a competitive edge. When it comes to search engine marketing today, the conversation almost exclusively starts (and stops) with Google, especially for brands optimizing for product searches. There’s an increasingly prominent player in the world of product search – and, given their disruption of just about every other industry on earth, who it is should come as little surprise. It’s Amazon, of course! In fact, more than half of product searches now begin on Amazon, circumventing Google entirely – and search ad budgets are starting to reflect and react to this shift. The same goes for SEO strategy – if they weren’t already, brands need to be intentional about optimizing product copy for Amazon, who provides some insights in to how its search algorithm works. It should come as little surprise that, just like with Google, placing on the first page of product searches is the holy grail. This doesn’t mean Google is losing its clout and value in product search, however. As the article states, while Amazon is growing as a center of product discover, Google is still being overwhelmingly used to validate purchases, as well as pricing, quality standards and brand reputation. In addition, Google still offers brands a more diverse array of ad options (like YouTube) and platforms for product search. So, what’s it all mean? For brands dedicating ad budgets to product search, Amazon is now a growing player and part of the conversation. Those search ad budgets should take this shift into account, if they weren’t already. And, as with seemingly every other industry around, brands must account for Amazon.